So far, Table Rock not not come up a full foot yet with all the rain we have had. Still some runoff, so we might make it. No problem, as we were 7 inches under power pool for this time of the year. Generation pretty much off the past two days. One for one hour at noon yesterday and scheduled to come on for an hours this evening. Schedule says we will see the same pattern for Monday. news was that it was a beautiful day, so they all enjoyed the day. Keith and Wayne from Illinois, spent the morning with Carolyn. Caught several fish right off stripping the holographic green crackleback and tiger tail on the 2.6 ips sinking leader. After catching several fish, we decided to go look for some larger ones. Pulled some more on the mini sculpin various other patterns, but nothing really big. 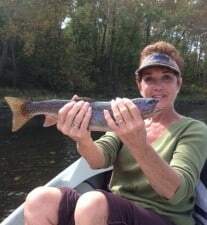 Most of the fish we caught, however, were good quality fish, in the 15-17 inch range. Last nice fish of the day was on the pumpkin crackleback stripping subsurface in shallow water. mainly on the white grub. Carolyn and Leon were out with Carolyn. Carolyn had a good day on the pumpkin crackleback, holographic green crackleback, tiger tail and big ugly. Carolyn had her “first”….pulling a couple nice fish on a dry…. the big ugly. Dana took David and his son, Zac out for half a day. Good days for these guys on the red San Juan worm, pumpkin crackleback and big ugly. Jim was down stream from all of us with Marg and Price. they had a good day on the JQ streamer and white grub. Dale got to use the gift certificate his wife bought him for a full day float with Jim on Thursday. They had a good day on the JQ, holographic green crackleback and white “thing” grub. Jim commented that the fish were “picky” at low water and I think we can all agree with this. Stan had Bob and Waldo from Texas out. They had a good day on the white grub in the early part of the morning and the P&P later that morning. 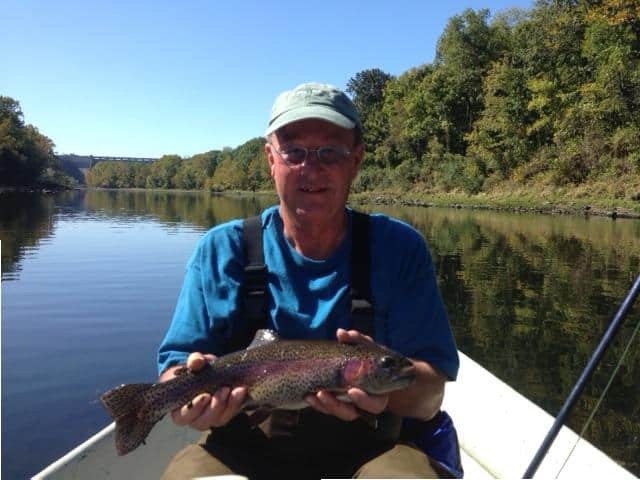 This entry was posted on Sunday, October 12th, 2014 at 3:57 pm	and is filed under Fishing Reports. You can follow any responses to this entry through the RSS 2.0 feed. You can leave a response, or trackback from your own site.